A snowflake wedding cake works really well for a winter or even a Christmas wedding, and it adds a fun, wintry twist to an otherwise boring cake. You have a couple options for this type of cake. 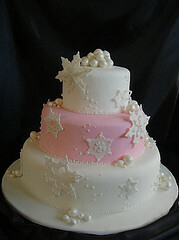 You can hire a cake designer to create a cake for you, or you can start with a traditional wedding cake and transform it into a snowflake cake. Do some research and figure out what best fits your budget, style and the rest of your wedding reception decorations. 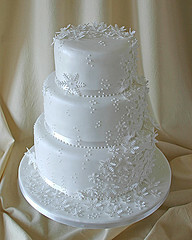 Fondant is a sugar paste that can be molded into snowflakes by a talented cake designer. This is a special talent, so be sure to interview cake designers and ask to see photos of their work before signing a contract. While white is the typical color for a wedding cake, don't be afraid to use a splash of bold color to brighten up your cake. Ice blue and pink work well as accent colors for winter weddings. 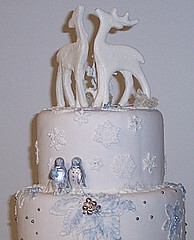 Wedding cake toppers can add a wintry touch to your cake. 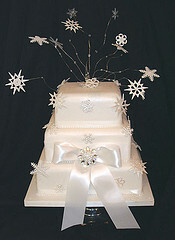 Look for snowflake cake toppers that fit in with the style and size of your cake.